Warm and tasty. 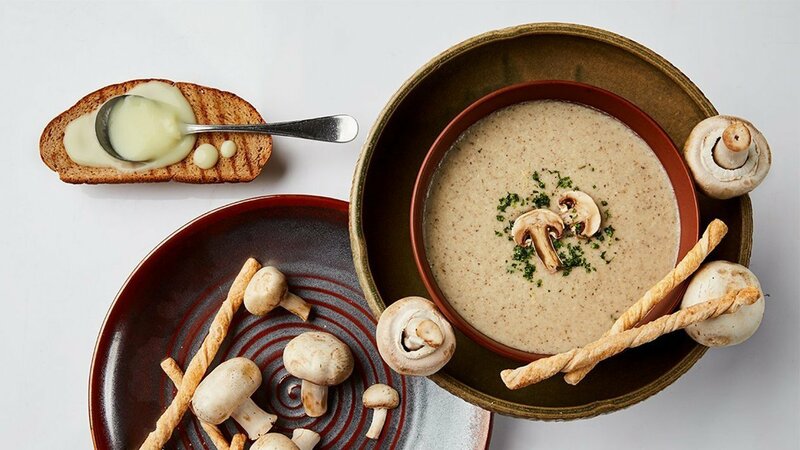 The secret to this deep rich soup is long caramelization of the soup base, the key to unlocking the best mushroom taste. Add water to the bowl. Add the Cream of Soup Base into the water. Stir until dissolved. Heat oil. Add the onions, garlic, button mushrooms. Saute until button mushrooms change color. Add the mixed water with the Cream of Soup Base. Mix well to prevent the soup burn quickly. Blend the mushrooms till' well blended. Cook until boiling. Blend the button mushrooms until they break and dissolve. Heat the pan and mix well. Lift the pan from the stove. Pour mushroom cream soup into a soup plate. Pour the Crouton on it. Garnish with parsley.